This is a copy of one of John Paul Chase's many artworks. It consists of a series of panels producing a panorama of the San Francisco skyline, as seen from the art room at Alcatraz. John Paul Chase was born Dec. 26, 1901, in San Francisco. He was involved in crime from an early age, and first came to the attention of police as a minor bootlegger in San Francisco. He played small roles in a variety of crimes in California, both as a freelancer and as an associate of organized crime groups. 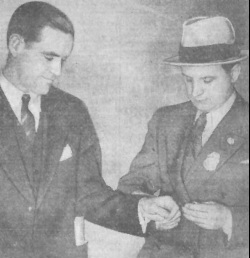 After his crime partner, George "Baby Face" Nelson died from wounds received in a gun battle with FBI agents, Chase helped dispose of the body and he and Nelson's wife, Helen Gillis, returned to Chicago where they went separate ways. Helen, alone and frightened, spent the night in an apartment house doorway. The next morning she turned herself into police and was arrested. Chase went to a safe house to make plans to head west. On Nov. 30, 1934, he responded to a want ad seeking someone to drive an automobile to Seattle. Ironically, he was required to go to the police station to be photographed (photo above) for a chauffeur's license. Because Chase's only arrest was for public drunkenness in 1931, however, no wanted circulars with his photo or fingerprints had ever been issued. In early December, the FBI's San Francisco office, betting Chase would try to return to California, contacted his former employers and associates. They were instructed to notify the FBI if Chase surfaced. The FBI's bet paid off. On Dec. 27, 1934, Chase approached employees at the Mount Shasta, Calif., fish hatcheries, where he had worked in 1928, trying to borrow money from a former co-worker. The FBI and local police were notified, and A.L. Roberts, the chief of police, arrested Chase without incident. 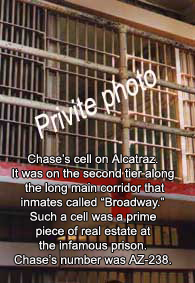 In September, 1954, Chase was transferred to the U.S. Penitentiary at Leavenworth. Chase was beginning to hope for a parole, but he was still under indictment for his part in the murder of Agent Hollis. A motion was filed in U.S. District Court in Chicago demanding immediate trial on the indictment or its dismissal. On Oct. 17, 1955, a U.S. District judge dismissed the indictment, ruling that Chase's knowledge of the indictment, and his failure to take action, did not constitute a waiver of his right to a speedy trial. Dismissal of the indictment cleared the way for Chase to apply for parole. After repeated attempts, he was finally paroled on Oct. 31, 1966. He returned to California where he worked as a janitor for a little over six years, until illness forced him into a county hospital. While working, he lived in a small room at a private residential hotel. Few of his neighbors were aware of his colorful past, only that he had spent many years in prison. He continued to paint in his free time, usually giving his works to anyone who showed an interest. He was described as quiet and friendly, but someone who kept to himself. 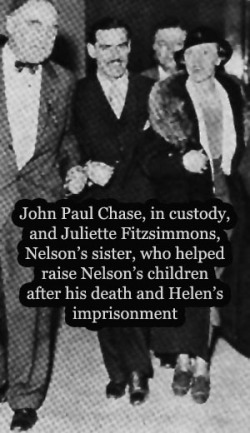 It's not known, but considered very unlikely, he had any contact with Helen Gillis after the night Nelson died. John Paul Chase died of colon cancer in Palo Alto, Calif., on Oct. 5, 1973, at the age of 71. He was buried there, his funeral attended by a small group of mourners. He still had a few surviving family members, but apparently none attended his burial. 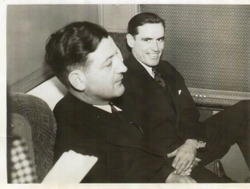 Chase arrives in a Chicago court in Febuary, 1935. Chase, right, arrives in court. Assorted mugshots as Chase ages. 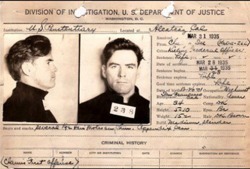 Chase enroute to prison after his 1935 conviction. Another of Chase's art works. 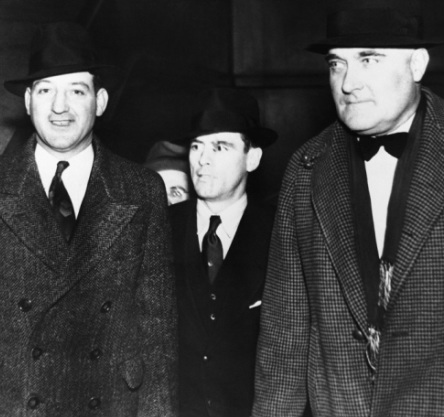 Chase, center, is led into court on Jan. 3, 1935, by U.S. Marshals.